Description: CP X500 crossing Haggerty Road and East Yard (Behind me); going to Detroit. Description: With the bottle train now on CSX trackage a CP intermodal clears CP502. Description: CP train #280 at West Wye. Description: Northbound freight at Smith siding meeting a southbound freight. It was a rolling meet. The Wabash river is out of its banks. Description: CP train #199 storms into Dakota MN. Description: A CP gevo leads a train of windmill parts west at Union Jct as the day comes to an end. Description: Not a great one. I tried. Early morning shot. Description: Sitting in the CSX Rougemere Yard. Description: Canadian Pacific runs a train into Oak Island from Binghamton NY and return using trackage rights over Norfolk Southern. Title: K633--- one for the ages! Description: The first 2 engines of K633 comes into view from behind the signal box at Wortendyke Rd. QC 407.4. The sun was quickly setting, and this was the one place I could avoid shadows. The Batavia, NY detector is visible in the foreground. Description: The money shot. 6 colorful locos in this lashup. Since I couldn't get them all at once, I got them individually in the next few shots. 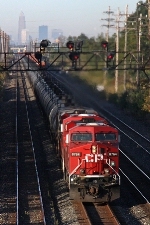 Description: CP 252 roars past milepost A139 under bright blue skies as they hustle south towards a crew change in Saratoga Springs. Description: After working in the yard in Plattsburgh and meeting her northbound counterpart, CP 252 roars south on the ex-D&H main near milepost A160 with manifest and intermodal traffic for Binghamton.